This month I shared the story of creating WonderTent Parties with Studio City South Magazine. As anyone who knows me will attest, I’m not a huge fan of having my photo taken, so to be featured as their cover story was both an honour and daunting experience, but photographer Hylah Hedgepeth was amazing and had me feeling comfortable being in front of the camera - well, as comfortable as I’m likely to ever be. For me, it was a chance to share my story. To talk about the joys and struggles of starting your own business. To chat about the fears of leaving a secure corporate job and taking the leap to follow a dream of running a business that gives back. I also share my story of adopting my teenage daughter and the wonderful work of Kidsave, and how adopting her was the genesis for creating WonderTent Parties. It’s my aim that with every WonderTent Parties experience that we always leave our clients feeling wow’d. I strive to make every sleepover, every slumber party, every glamping experience an unforgettable one. One that creates memories for everyone involved. Memories and moments that stick with them for life. A moment of joy and wonder they cherish, and can fondly look back on. And as I share in the article it’s also an opportunity to give back, with a portion of the proceeds from every experience being donated to Kidsave through our Good Intent program. It’s my hope that in bringing joy and wonder to families we can all help older youth in foster care find their own joy and wonder through forever families and life long connections with adult mentors. And this is just part of the great work Kidsave do. If you’d like to read the article click here. And thank you for continuing to support WonderTent Parties and for helping us create a little wonder. Looking to share the wonder these holidays? 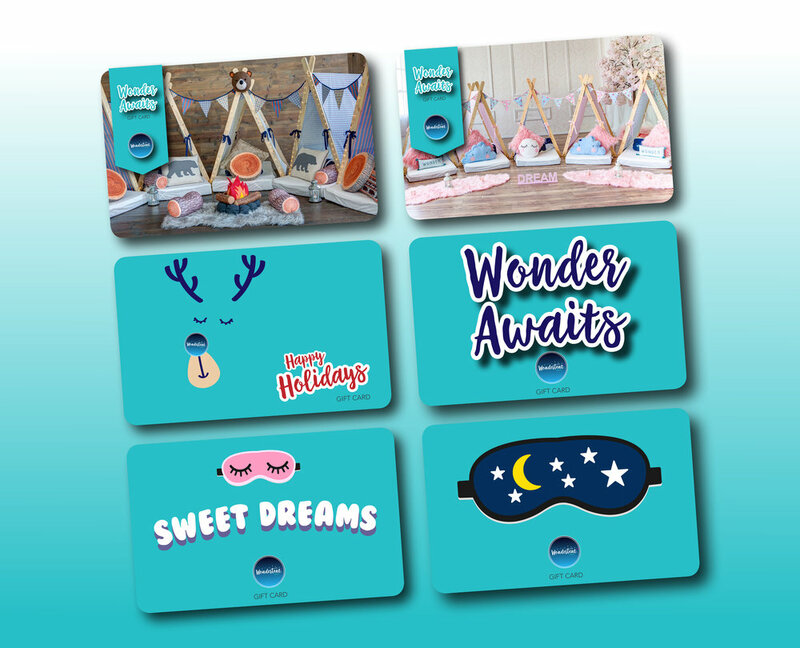 Now you can with our exclusive range of WonderTent Parties eGift Cards. Send a gift instantly via email in any amount you choose and bring a sense of Wow to your gift giving. eGift card amounts can be used towards any WonderTent Parties experience from our 5-Star SleepOvers to our glamorous GlampOut events or any of our wow-worthy add ons like our Movie Experience or Dining Experience. Send instantly or set it to be delivered on a future date like a birthday or anniversary. And if you listen closely you’ll hear the screams of “OMG! OMG! OMG!” when they open it. It’s the perfect way to give a memory making experience to be cherished forever. WonderTent Parties delivers in-home sleepover parties and glamping experiences like no other. Make your next sleepover or special event unforgettable with our range of themed sleepover and glamping experiences. Sign up to receive party tips, be first to hear about new offerings, and access to exclusive discounts.